SNHR has published its special periodic report on attacks against vital civilian facilities by the parties to the conflict in Syria. The report also notes that an extensive round of talk that commenced in May 2017 in the Amman, Jordan’s capital, between Russia, USA, and Jordan was followed by an announcement by the American and Russian presidents, on the sidelines of the 2017 G20 summit in Hamburg, that a ceasefire agreement has been reached in southwestern Syria – Daraa, Quneitra, and Suwayda governorates. The agreement went into force at 12:00 on Sunday July 9, 2017, and provided for the passage of humanitarian aids in addition to a ceasefire between the conflicting parties (Syrian regime forces and their allies on one side, and armed opposition factions on the other side). Also, the agreement specifies that maintaining security in this region is the Russian forces’ responsibility in coordination with the Americans and Jordanians. The report adds that these agreements reflected on the civilians’ living aspects in the included areas, as more patients felt more encouraged to go to hospitals and medical points, and children rejoined schools after their families prevented them from leaving the house out of fear for their lives in light of the frequent bombardment on schools, as well as hospitals. Also, markets became livelier, and infrastructure services were renovated thanks to a number of service workshops. Nonetheless, breaches didn’t stop, mainly by the Syrian regime, who is seemingly the party that would be most affected should the ceasefire go on, and in particular extrajudicial killing crimes and, more horrendously, deaths due to torture. This strongly asserts that there is a ceasefire of some sort on the table, but the crimes that the international community -particularly the sponsoring states- won’t see are still going on as nothing had changed. We recorded in last July, and for the third month in a row, a drop in the rates of incidents of attack on vital civilian facilities by the Syrian-Russian alliance compared to the months preceding the de-escalation agreement. However, the Syrian regime still exceeds all the other parties to the conflict in terms of incidents of attack on vital civilian facilities. Also, the number of attacks on vital civilian facilities by the international coalition forces have decreased almost by half compared to last June. The report documents 546 incidents of attack on vital civilian facilities between the start of 2017 and August of the same year. Moreover, the report records 52 incidents of attack in July, including 25 by Syrian regime forces, while the remaining attacks were distributed as follows: four by Russian forces, four by ISIS, six by international coalition forces, two by armed opposition factions, and 11 by other parties. 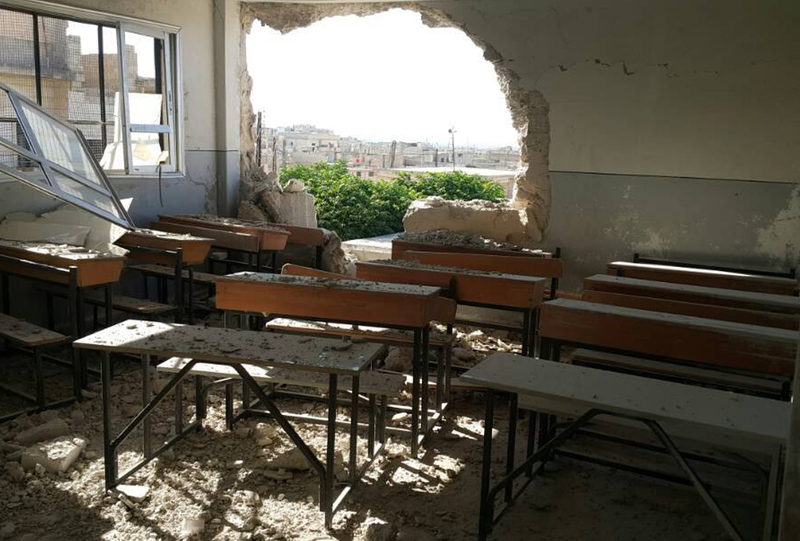 The report breaks down the vital civilian facilities that were attacked in the month of July – 17 vital educational facilities, 14 infrastructures, 12 places of worship, five communal facilities, three vital medical facilities, one vital cultural facility. The type and number of evidences vary from one case to another. In light of the challenges we mentioned above, many of the incidents’ legal description change based on new evidences or clues that surface after we had released the report. We add these evidences and clues to our data archive. On the other hand, many incidents don’t constitute a violation to the international humanitarian law, but it involved collateral damages, so we record and archive these incidents to know what happened historically and to preserve it as a national record. However, they don’t necessarily qualify as crimes. The report also notes that Russian forces, ISIS, international coalition forces, some of the armed opposition factions, and other parties (Includes groups that we weren’t able to identify and the Turkish, Lebanese, and Jordanian forces) have attacked some of these facilities. The indiscriminate random bombardment is a violation of the international humanitarian law and amounts to a war crime.